When planning your next ski season, one factor that often gets overlooked is how busy the best ski resorts can get at peak season. It’s unlikely you’ll want to be tripping over other skiers on the slopes or battling for space at the après ski bar. Luckily, it’s possible to find quieter, top ski resorts in Europe a little off the beaten track. We’ve put together this list of where to ski without the crowds this winter, so you can plan a relaxing holiday and make the most of your time on the slopes. At these Alpine ski resorts, you can feel safe in the knowledge you won’t be bombarded by herds of skiers on the mountain. Les Menuires is one of the lesser known ski resorts in the Three Valleys. But, it’s not one to be overlooked, particularly for those hoping to escape the crowds! 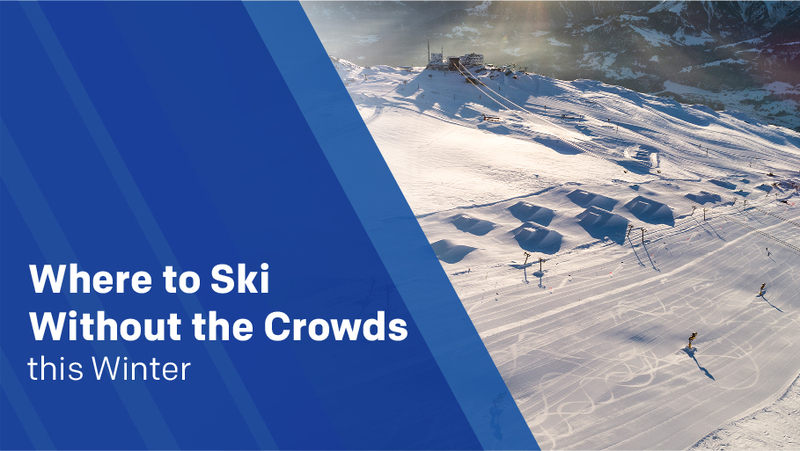 While the Three Valleys are known for providing some of the best skiing in Europe, and the resorts of Val Thorens and Méribel attract big crowds, Les Menuires tends to be the quietest option in the area. 160km of long, wide slopes make it a good bet for beginners and intermediates and the nursery slope has recently been updated. Six moving carpet lifts provide a safe and comfortable way for new skiers to make it up the mountain without having to negotiate precarious drag lifts. Another good thing about Les Menuires being left out of the guide books is that it’s kinder on the budget! Les Menuires’ handy location an hour and a half from Chambéry airport also means ski transfers don’t take an age. Some people aren’t too keen on the 1960s Bauhaus style architecture in the village, but if it’s uncrowded slopes and an expansive ski area you’re after, Les Menuires is the place to be. Leogang in Austria is often left in the shadow of the larger, better known Saalbach resort. This means, that although both resorts share the same ski area, Leogang is left to its own devices and has quieter slopes. The Alpine ski resort’s long, gentle runs make it a good choice for beginners and those learning to ski. Make the most of great skiing conditions and value for money while this resort remains under the radar. Crowd-free slopes don’t mean you have to compromise on high adrenaline skiing. Thanks to its famous neighbour, Zermatt, Saas-Fee enjoys uncrowded slopes and a laid back vibe. That’s not to say it’s not for serious skiers. The fact Saas-Fee holds an ‘adrenaline cup’ gives an inkling to the kind of skiing on offer. Perched on the highest part of the Alps with a lift line of 3600 metres at its highest point, Saas-Fee provides hair-raising descents. There’s also a freestyle park for pro skiers to practice their tricks and let their creative juices flow. In terms of getting there, an airport transfer from Geneva airport is probably your best bet as it offers more flights than the closer airports. The delightful village of Sainte Foy contains a cluster of idyllic, traditional chalets with a few shops and bars. It may not be party central, but it has tranquil slopes and enough variety to entertain even the most accomplished of skiers. Because of the decision to limit building to four lifts, the resort has seen a significant drop in visitors. However, this has resulted in minimal waiting times so skiers can make the most of the off-piste runs. Sainte Foy is home to the exhilarating ‘Crystal Dark’ drop, a dizzying descent from the peak. Not for the faint hearted. The resort is easily accessible from the Bourg St Maurice train station. You may also like: What Should Be On Your Pre-Season Ski Shopping List? Calm slopes are even more important for families with young children trying out their skis for the first time. Obergurgl is a compact, traditional resort with a car-free centre and a mellow atmosphere. The ski area is perfect for beginners, however there are more challenging routes nearby covered by the Obergurgl ski pass. The big draw for families is the collection of ski schools accepting children from the age of three. English speaking ski instructors and lots of indoor and outdoor activities mean little ones are kept entertained all day. Many of the resorts hotels and chalets also offer childcare, so parents can relax at the spa. The resort is close to Innsbruck airport, making your private transfer a breeze. If you’re looking for a fuss-free ski holiday for you and your family, Flaine is a great option. Easy access to the slopes, excellent beginner slopes and family lift pass ski deals make Flaine the place to go for ease and relaxation. Friendly locals and a wealth of activities for non-skiers makes Wengen a fantastic place for a relaxing family break. Trundle up the mountain on the quaint cog railway to the highest railway station in Europe for a stunning view of the Aletsch Glacier, a UNESCO world heritage site. Visitors from the UK will feel right at home at the village cinema which shows films in English and the kindergartens have lots of experience looking after British children. Reach Wengen via private or shared transfer from Zurich airport in under two hours. Champoluc is a hidden gem in the Monterosa ski area that boasts breathtaking alpine scenery and skiing options for all levels. What makes Champoluc suitable for families is the nursery run by British childminders and a good ski school teaching children from the age of four. Explore cross-country trails or visit the outdoor ice rink if your family gets tired of skiing. Champoluc is easily reachable from Turin airport. Not all luxury ski resorts are full of fashionistas posing on the pistes. Cortina d’Ampezzo is strangely quiet on the slopes considering it’s famous for being one of the most fashionable, upmarket resorts in Italy. Perhaps it’s because the majority of the elegant crowds are busy shopping in designer boutiques and sipping cocktails in the fine restaurants in town. This means the 140 kilometres of slopes and varied terrain make for a pleasant, peaceful ride for all abilities. Although quiet by day, the resort thrums with life at night when everyone comes out to party at the exclusive nightclubs. Fly to Venice Marco Polo airport and take a quick and easy transfer to the resort. Here at Alps2Alps, we’re dedicated to making your ski trip as convenient and affordable as possible. Now we’ve shared our insider knowledge with you, it’s time to start planning your ski holiday at one of these underrated resorts. Don’t forget to book your reliable, low-cost ski transfer before you travel for a blissfully fuss-free holiday.